A beautiful heart shaped pink topaz pendant with three brilliant diamonds set in 10K white gold. Heart shaped gemstone weighs approximately 1.00 carat and measures 6mm X 6mm. 3 diamonds weigh 0.15 total carat weight. The pendant hangs from an 18 inch white gold rope chain included. Also available in Amethyst, Blue Topaz, Garnet, or Smokey Quartz. 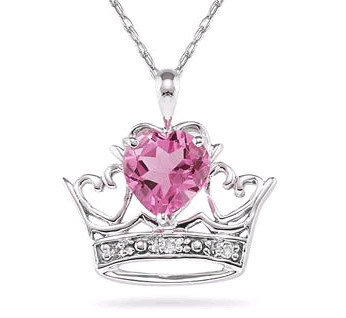 We guarantee our Crown Heart Pink Topaz and Diamond Pendant to be high quality, authentic jewelry, as described above.